Another Monday...Another sketch from MJ at TechnoStamper. Creative sketches call for creative measures! I looked at this weeks sketch and knew what I wanted to put in the slanted box, problem was I couldn't find it! Okay, so I didn't really look that hard, and couldn't remember where I had stashed them....I know - you're thinking c'mon already what is the "them" you are talking about...Well, I had some great "Dear Santa" letters that my boys wrote when they were younger (at 13 and 14 you won't find a cute child like Dear Santa letter in my house anymore). Anyhow, that's what I was going to use, but instead I googled for some Christmas Sheet Music and used that. 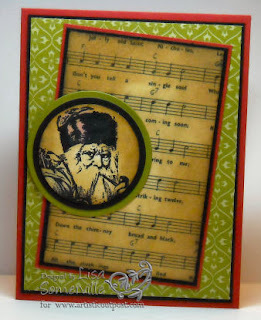 The vintage Santa comes from the Artistic Outpost Snow Woods Plate - I used my Circle Nesties to cut the circle layers, and used the Burnt Edges Technique to add color to my sheet music and Santa image. After taking the photo, I'm thinking it may just need a little something else, so you may see an updated version later on. 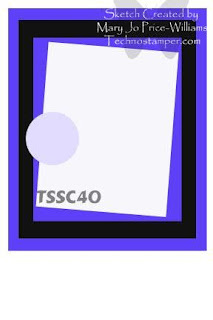 Here's MJ's original sketch if you'd like to play along, just leave your link here or if uploading to SCS, use keyword TSSC40. aaaaw! What a great idea to use use the letters to santa!! Too bad you couldn't find them. But the music looks gorgeous! very vintage-y and sophisticated. Beautiful card! That is an awesome idea! How cute that would be. I am loving this paper though. I love sheet music being used in crafts. Of course that may be because I love music. The Santa really pops. This is a stunning card. Thanks for playing as always. 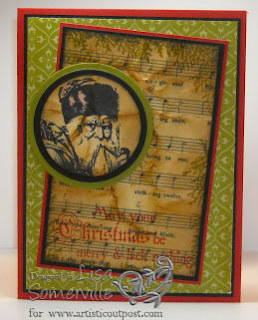 OOh, Love the vintage look and the vintage Santa looks great with the burnt edges sheet music. Beautiful card, Lisa!! Great card Lisa! Love the background and the colors this week. Love the vintage look! The colors are just perfect for it. What a cute card! Love the vintage look.